The Color Purple, or “Oh, It’s Canada” . . .
June is in bloom. The weather has been sunny, warm, and very dry for nearly a month. In fact, New York City has received less rain in the past four weeks (approximately two inches) than it did during just one wet day in early May. The damp early spring continues to support a healthy late spring bloom marked by steady, vigorous growth both in the variety and number of wild flowering plants. Now a second wave of wildflowers has sprung into view. The delicate pastels of April and May have been replaced by the hardier blue, white, and yellow of Asiatic Dayflower, Galinsoga, and Yellow Sow Thistle, to name a few. The vast Asteraceae family is well represented by the Dandelion and the Yellow Sow Thistle and now another member of the genus Cirsium, the thistles, has reached the flowering stage. 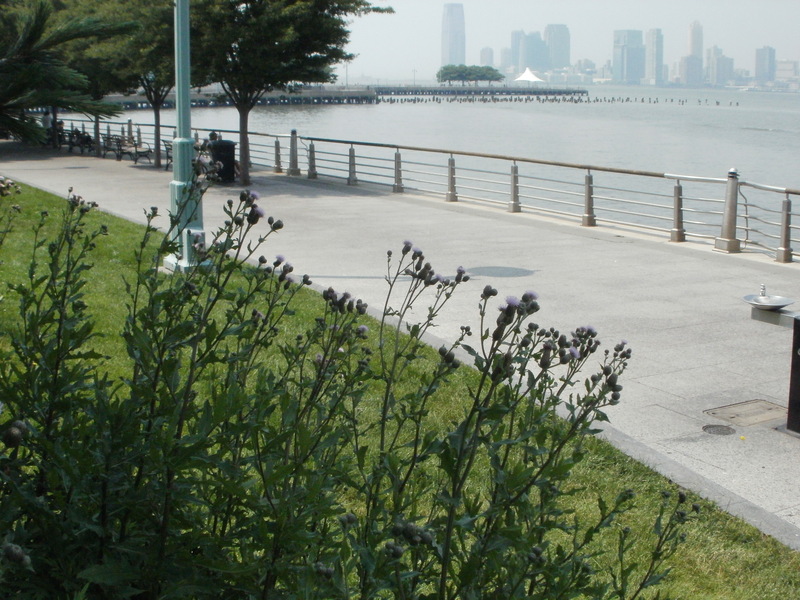 Groups of tall spiny plants have begun to line the West Side Highway, their flowers painting patches of delicate purple. Small in size, yet large in number, these colorful flowers are the calling card of the perennial Canada Thistle. 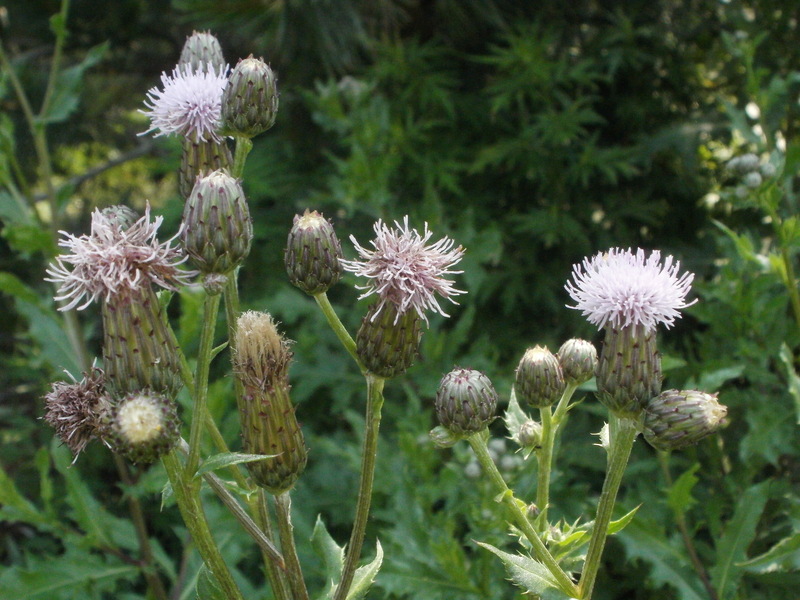 Cirsium arvense, an immigrant from temperate regions of Eurasia, has found a home across the northern United States and Canada. Individually, the plant rises to about three feet in height. 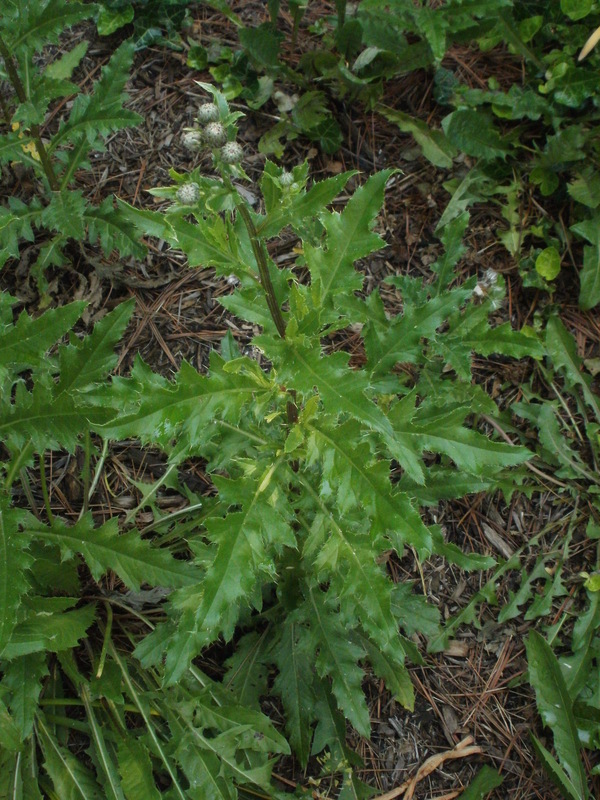 The stems are smooth, the leaves sharply lobed and spiny. The specie’s particular shade of green lacks the bluish cruciferous look of the yellow sow thistle and the spines are neither as thick nor as painful as those of the larger bull thistle. The flowers are numerous, light purple in color, and each is supported by a scaled calyx, one of my favorite plant structures, which to my eye resembles an ancient Greek vase. 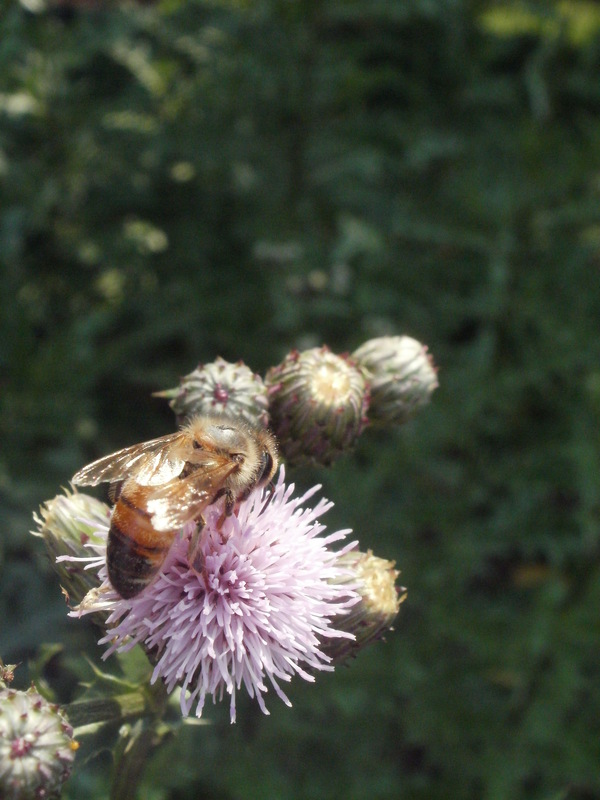 The numerous flowers of a mature Canada Thistle attract honeybees in droves. Each inflorescence is composed of florets, which these industrious insects work over methodically. Sometimes it seems as if there is one bee for each bloom. The end result for the thistle is a prodigious amount of seeds. However, the massive flowering groups often found growing along river banks, park edges, and city thoroughfares are actually clones. A single Canada Thistle plant sends out a taproot that forms a lateral network in the adjacent area. Buds along this root system send up shoots that emerge all at a time in a growth spurt called a flush. The stalks rise from rosettes and create tightly-knit clonal colonies that can over time get out of hand. Considered an invasive by most, I still appreciate this immigrant’s beauty. Most urban wildflowers are white or yellow. The color purple of the Canada Thistle is a welcome contrast, as are the insects, like the honeybee, and the songbirds, like the goldfinch, which are attracted to its flowers and achene, respectively.